Due to a huge number of emails requesting for team build guide, I thought of starting off with lineups that best suits for Kushina Uzumaki [Red Hot-Blooded Habanero]. I know most of you might not have this ninja yet. But, you might get her in future for sure. If you get her these lineups would be a great help. These lineups will be for advanced players who have some of the top ninjas. As Kushina has great CC, she will be the best choice to be on the front-line. 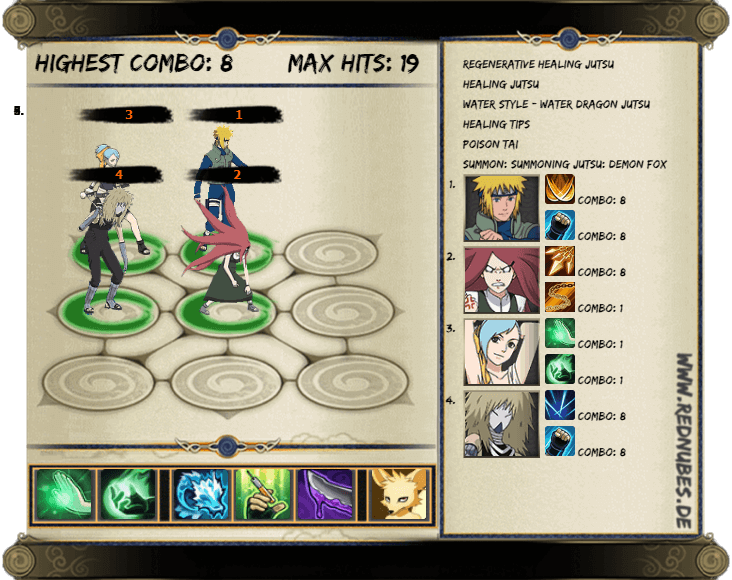 Sage Naruto will play an incredible role in great damage output while getting buffs and barriers from Shisui. Shisui will play his role in creating Chaos and inflicting Ignite damage, Breeze dancer will provide huge support with clones and Mystery refresh for the whole team. 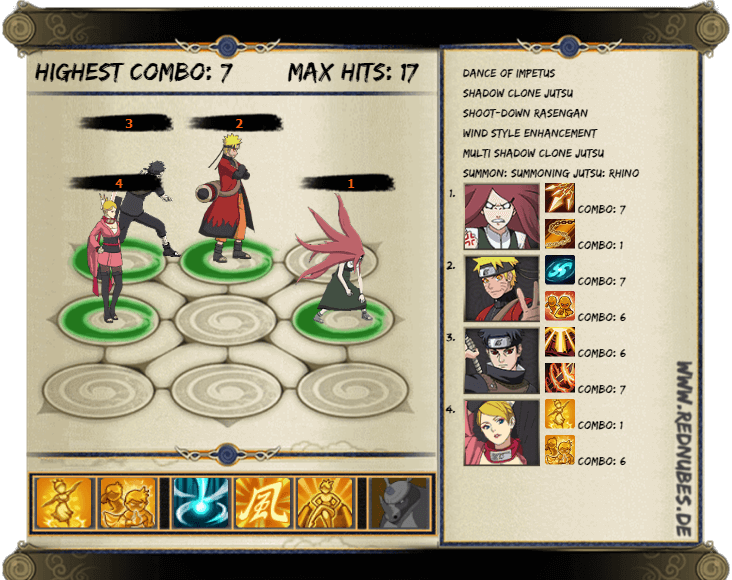 This team will produce maximum 7 COMBO and 17 hits. An offensive yet sustainable team which can fight any team out there. As great double attack Buff to Naruto[Kurama Mode] and passive of Lightning Main Anbu Special Assault Tactics will work like wonder. Although the Lightning main is not focused on being offensive, Naruto[Kurama Mode] and Kushina will give huge damage and sustainability for the team. Both Minato and Kushina have great CC in this Lineup. With Kushimaru who can provide great damage is an additional strength to this team. As the Water main will focus on healing and removing debuffs with Mystery this Water lineup will provide great damage and survivability. There is a good synchronization between Kushina and Minato Fourth Hokage in this Lineup. Minato is able to do massive damage, tag and Interruption. 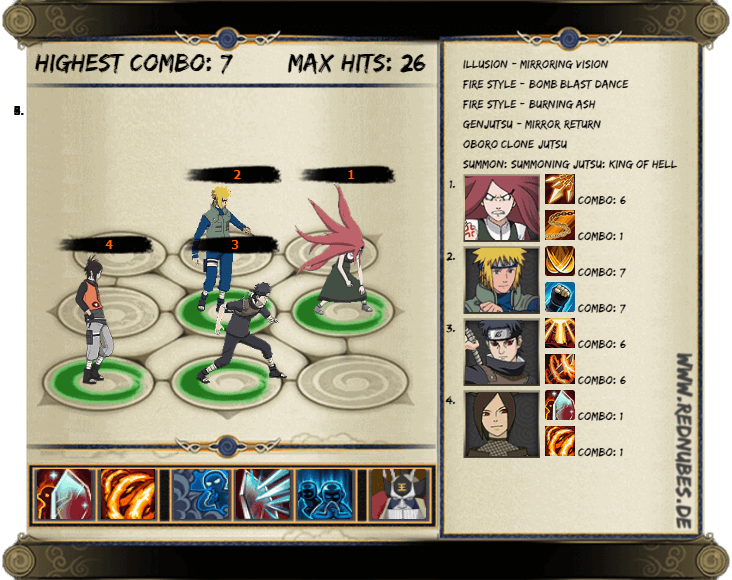 Shisui will create barriers for other 2 ninjas while causing Chaos for 2 rounds and Ignition. Kushina will become super tanky on the front line with the buff provided by Earth Main. For me, this is one of the best Earth Main team for lasting sustainability. The combination of Kusina and Minato Jonin is epic. With the addition of Fire main abilities, this team can be super annoying for the opponents due to the debuff removal. 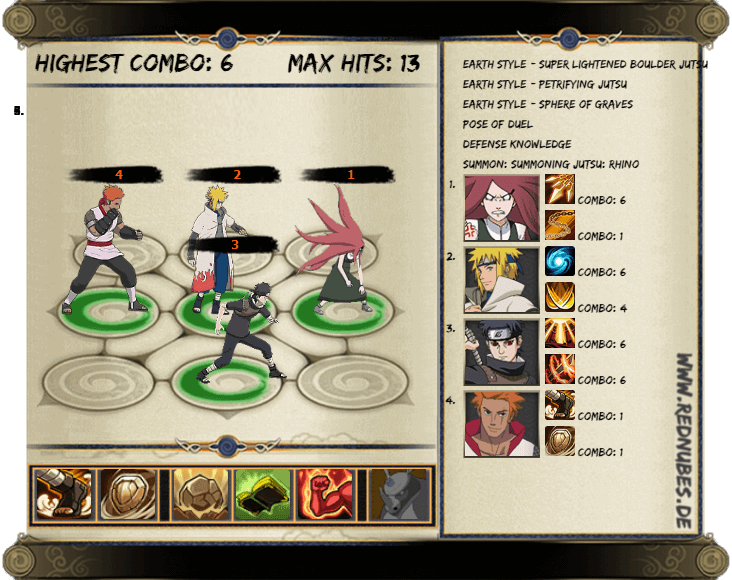 Kushina has a high CC and able to dominate the frontline with her self-healing ability. The barrier and chaos by Shisui play an important role in this lineup. 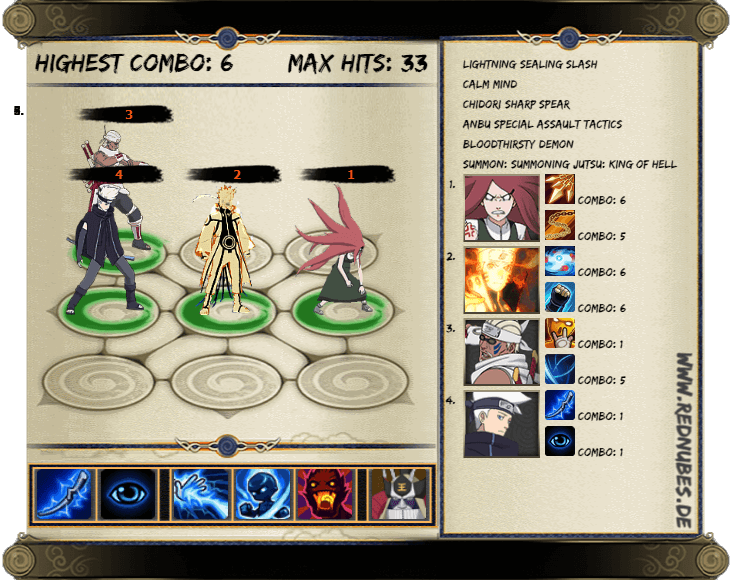 With the Fire main support abilities, Minato able to outburst the opponent team. Have you tried any other lineups with Kushina Uzumaki [Red Hot-Blooded Habanero]? Note** I will be doing more team guides in coming weeks. I will start from the basic team formation guide for the main characters.